The wails of my three-year-old had, once again, raised to a feverish pitch behind me as it had so many times during our family’s week-long holiday trip to Colorado with friends. It shouldn’t have been surprising. His normal schedule was out the window, sleeping arrangements were different every night, and the mountains in Colorado between Christmas and New Years are really, really cold. But my youngest child’s tantrums in the last several days had begun to be beyond the pale, consisting mainly of ridiculous, and often contradictory, demands to which we couldn’t have caved even if we wanted to. I know. It ain’t easy being three. But after a while, the screaming kind of starts to encroach on one’s holiday cheer. The setting for today’s throw down was particularly picturesque–toward the beginning of a .3 mile hike through snowy woods to see a frozen waterfall. 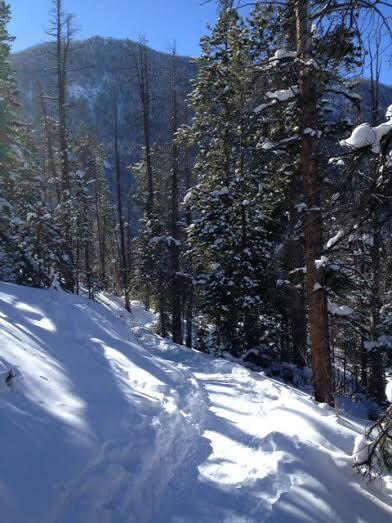 The rest of my family and friends seemed to be trekking happily up the snowpacked trail. Some kids were even giggling as they were pulled in a sled behind their dad. My kid, apparently, was suddenly not enthusiastic about this outing. Despite tries by other adults, he refused to budge. I volunteered to stay behind to see what could be done. I kept calm. I instructed firmly. I asked nicely. I offered him a ride on our friend’s sled. I gave him the choice to walk or be carried. After about fifteen minutes, I was starting to be less calm. Starting to raise my voice, I walked ahead to the curve and impatiently told him to catch up, implying he might be left behind. Not my finest move, but I was starting to run out of cards to play. Nothing worked. And there we stood, dozens of yards away, staring defiantly at each other. Of course. Although I thought everyone had gone potty before we snow-suited them up, at least now I had a reason for his obstinance. I walked back to my red-faced, teary, scowling little boy and crouched down next to him. I slowly reviewed our options with him, including the most obvious, but chilliest, way to resolve the problem. He chose to hold it. But now, at least, he was calmer and said I could carry him. I confidently picked him up and quickly plodded up the path and around a bend. Within a minute, the slope of the trail started to climb, and I was reminded how hard it had been for me to climb back up a sledding hill the day before. Due to a combination of rather worn-down boots and feet that angle outwards, I had discovered that climbing up slick snow was apparently a bit more difficult for me than the others in my group. Now my feet slipped and I slowed, trying to concentrate on my footing. Hmmm… Maybe it was a lot more difficult. The trail grew even steeper, and my heart and breathing increased. Was this even safe? I was disappointed–the others were nowhere to be seen. They must’ve made it up this way fine. Several more steps, and my feet slipped again. Now that I had gone to such lengths to convince my kid that we were going up this trail and that it would be fun, I didn’t want to let him down now. I carefully took more steps, trying to angle my toes in for more traction. No use. Suddenly, I felt myself completely falling. Panicked, I somehow pivoted just enough to keep the child in my arms above me. And then we were on the ground, clinging tightly to each other, both a little freaked out. He started to cry, this time for good reason. “Okay!” Someone was suddenly more cheerful. Digging at least one foot into softer snow off the side of the path to anchor me, I held his hand and stretched my arm forward as he walked 4 or five steps forward. Then, as he waited, I carefully moved up two or three steps myself. Repeat. Repeat. Again and again. As it turned out, this was the perfect pace for both a three-year-old and a guy with bung feet and useless boots. And as we moved slowly up the mountain on what was undoubtedly the longest .3 miles of my life, I had no choice but to stop when he stopped, and look at what he looked at, and talk about what he wanted to talk about. We noticed it was quiet. We saw the sun beaming through the tall trees. We saw the snow sparkle around us. We looked at boulders peeking out from under the white. We poked our gloves into snowbanks. We noticed different trees had different colored bark. We saw another mountain rise up between the trees. I once heard a priest ask his congregation to name the Christ-character in the parable of the Good Samaritan. It was not, in fact, the Samaritan. Not the priest, nor the Levite, nor the inn-keeper. Rather, Jesus was represented by the man left to die by robbers by the side of the road. Just as the helpless man left by the side of the road compelled the Samaritan to extraordinary acts of compassion and love, the broken, beaten, crucified Christ on the cross compels the most unlikely people to act with compassion and love, sometimes when they aren’t expecting to. And there, in the cold quiet of a Colorado mountain side, my seemingly helpless three-year old made me stop, slow down, and recognize my own weakness, my own helplessness. Surrounded by light and snow and towering evergreens, I had to rely on my child for my balance… and perspective. The frozen waterfall was, frankly, underwhelming. This wouldn’t be the last tantrum my kid threw on this trip. Nor was it the last time I had to slow down and walk at his speed. But on the way back down the mountain, my stubborn three-year-old refused to go with mommy or any others who offered to carry him. Naturally, he insisted on walking back with me–very slowly.